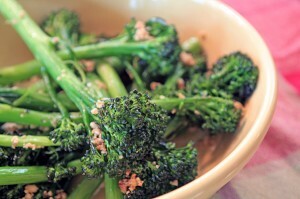 The broccolini in this side dish is vibrant. It’s roasted until just a little tender, but still fresh, with a little crunch. Add some salty cashews or pine nuts to the mix and you have one incredible dish. I love to serve this up as a special side during the holidays; it’s really delicious with my Figgy Glazed Piggy. But you don’t need a holiday to enjoy these veggies. Serve with some grilled teriyaki chicken over noodles or rice and you will have one comforting meal! Can’t find broccolini? No problem, just sub them out for large broccoli stalks, cut length-wise into quarters. Preheat the oven to 400. In a food processor add Parmesan cheese, pine nuts or cashews, lemon zest, and pinch of salt. Pulse to combine until it becomes the consistency of sand. Place the broccolini on a baking sheet. Drizzle with butter and season with salt and pepper. Toss to combine and sprinkle the nut mixture on top. Roast in the oven until broccolini begins to caramelize, about 10-12 minutes.